Roy (Gordon Mitchell) fakes his own death in order to bamboozle his old partners by burying their stolen booty in his coffin. 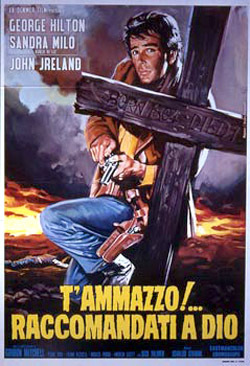 He enlists Glenn (George Hilton) to help him. The Colonel (John Ireland) and Portugese (Piero Vida) are not so easily fooled. They soon catch up, kill their betrayer and reclaim the loot. This leaves Glenn without his promised share, and he determines to track them down and lay his hands on what’s illegally his. Not, however, before taking a bit of time out to seduce some handy married women in typical George Hilton style. You have the feeling that Osvaldo Civirani was trying to make a gloomy sagebrush epic with this genre entry. He combines the look of Django (66) (mud, rain, and wide-open spaces) with a plot that is only a thinly disguised replay of The Good the Bad and the Ugly (66). 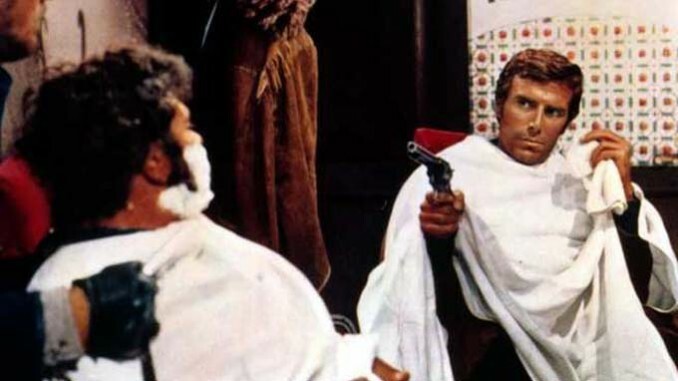 Unfortunately, he hasn’t a fraction of the talent that Sergio Corbucci or Sergio Leone were blessed with, so what you end up with is something, bad, ugly and – by no definition of the word – good. With all the pace of the North Circular on a bank holiday, the main achievement of Dead for a Dollar is that it features some truly ugly bit performers. These guys shed a whole new light on the aesthetic possibilities of genetic engineering. Civirani is the most infuriating of directors. He’s assembled a nice cast, a reasonable (if derivative) script and some good music. There are even some nice bizarre touches – a gunfight in a boutique full of mannequins, for instance. But it’s all so stodgy that you can’t help but fall into an uncomfortable torpor. Much like all of his films, really (see The Devil With 7 Faces (72) for a similarly soporific effect). This also has – according to my precise timings – the most protracted ‘coarse eating’ scene in cinema history, during which the camera stares fixedly at a succession of open mouths chewing loudly for four minutes and twenty six seconds. Spot on. I’ve seen this film a few times but only once intentionally. As you say a waste of a nice cast but I dread these films where it involves a chase and repeated swindles and double-crosses. A gross time waster by all involved.